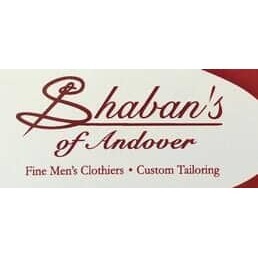 Shaban's of Andover is a high-end men's specialty store located at 9 Main Street in Andover. Shaban's is a favorite for one-stop shopping featuring classic modern suits, business casual attire, exciting dress shirts and ties and sharp weekend wear. Our Huge selection of quality designer jeans and stylish footwear handcrafted in Germany are available in many styles and sizes. Shaban's offers custom tailoring and alterations for everyone and next day dry cleaning. Shaban has been a custom tailor for over 40 years and welcomes any challenge. Shaban's customer service and attention to detail has been voted the best. Please feel free to stop by our shop or call with any questions. We look forward to serving you.